The Squeeze Inn burger joint has received many accolades over the years: three time KCRA 3 A-List Winner, five time winner of “best dive” by Sacramento Magazine, and got a visit from Food Network’s Guy Fieri. While known for their burgers with cheese “skirts”, the Squeeze Inn has found themselves in quite a pickle. Kimberly Block, an individual with a disability, has filed a lawsuit against the Squeeze Inn alleging the establishment broke federal law and violated her civil rights. Block is represented by Jason. K Singleton, an attorney who has filed other ADA suits in the state. The suit includes what looks like a carefully tallied list of ADA violations, and asks the court to force the establishment to make the fixes and award Block an unspecified amount. Squeeze Inn owner Travis E. Hausauer fears the required changes would be too expensive and force him to move. This suit exposes an issue with the ADA and the multiple lawsuits surrounding it over the past few years. Lawsuits will not bring accessibility to small businesses. It closes them completely. One only needs to look at the closure of Rancho Cordova’s Basketball Town in 2007 to see the result of ADA lawsuits on small businesses. The establishment was a 50,000-square-foot basketball gym for kids and families. Unlike the Squeeze Inn, Basketball Town opened in 2001, nearly ten years after the passage of the ADA. The establishment was sued in January 2001 by a man using a wheelchair attending a birthday party with his nephew, but could not access the upper-deck lounge where the party was held. Though Basketball Town may have brought their suit on themselves, the Squeeze Inn is not. The facility opened in 1977, well before the ADA and accessibility regulations. What the suit essentially asks for is a total reconstruction of the facility, something totally unrealistic in these financial times. It is essential for all individuals to have access. 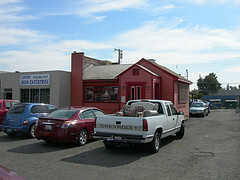 The Squeeze Inn is very small and does not have an accessible entrance. But is providing accessibility what really motivates this suit? Block’s attorney Singleton, who has sued numerous businesses in his home area of Eureka, CA, has been called a lawyer who hunts for ADA violations to make money. Some North Sac Businesses such as the new Walgreens, Rite-Aid, Kragen, and McDonalds are in new facilities and are probably safe in terms of accessibility. Those in older buildings may want to double check their accessibility. Hopefully this will blow over and we can continue to drive out and have a “Squeeze with Cheese”. July 8, 2009 in Uncategorized.